I live in a big city that can seem like a big city, but at times it also seems like I live in a small village. One of the things I am most thankful for in 2018 is successful hip surgery. I had been in pain for quite some time and it was amazing to have surgery to fix this. The support and encouragement from my neighbours was even more amazing. 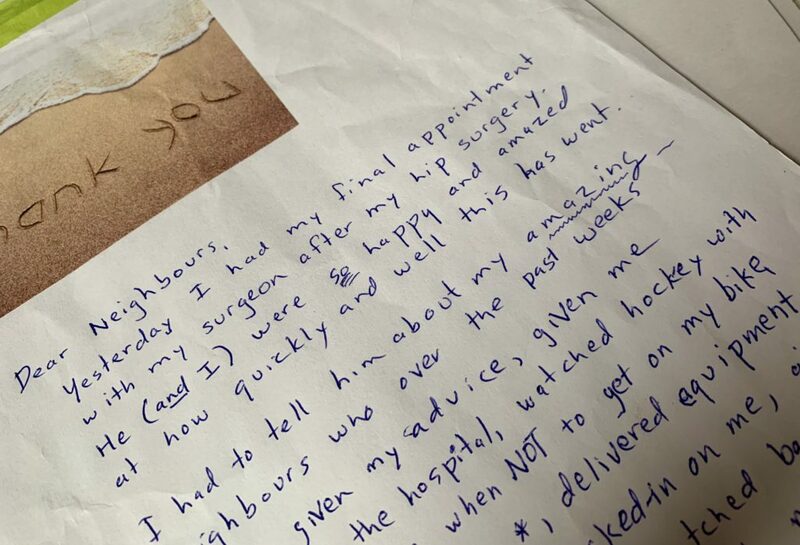 The photo is from a thank you I posted for my neighbours who among other things gave me: encouragement, food, advice, rides to and MOST importantly from the hospital, company to watch baseball games on tv, visits, walked with me, rides to physio and knowing I was from the Midwest even a mint julep on Derby Day.